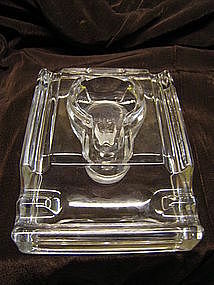 Vintage acrylic/lucite double pen holder. Comes with the original pens. They need refills, as these appear to be dried or out of ink. 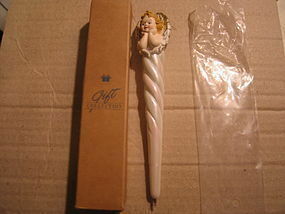 Gift Collection pen manufactured in 1997. It is non-refillable, but has not been used and still has plastic seal on the tip. I don't know if it the ink has dried up, but hate to remove seal. It comes with the plastic inner bag and original box, however, the box does have a stain. I need your zip code to calculate the postage. 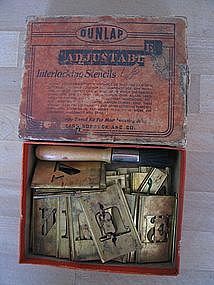 Interlocking stencil set manufactured for Sears and Roebuck. 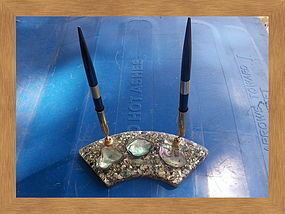 It has the original brush. As you can see in the photograph, the box shows a lot of wear and stains. There is only 1 (one) of C,E,F,O,R and S. I will be happy to photograph the contents to give a complete inventory. I need your zip code to calculate the postage. 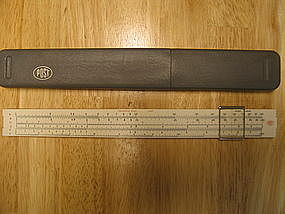 Marked Frederick Post 1447 Hemmi Japan slide rule with case. The plastic case has a few superficial marks to the exterior. Complete condition and identification photos by email. I need your zip code to calculate the postage. 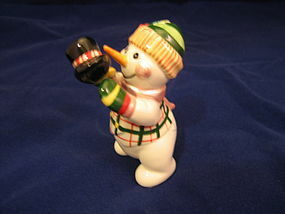 Figurine is being sold as a replacement to the 2005 Frosty Friends Tumbler set. This snowman holding a top hat wearing a plaid vest and stocking hat. It is coming from the original box and packaging material. There is no damage. Other pieces of the set is are available. Other photos are available, including the original box, for matching purpose. I need your zip code to calculate the postage. 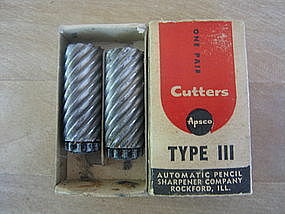 Vintage set of replacement pencil sharpener cutters. The back says it works for Giant, Power and Marvel. There is no damage, but the box shows wear and age. I need your zip code to calculate the postage. 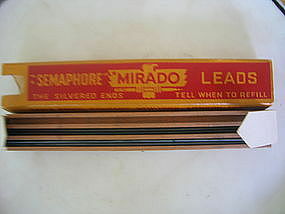 Vintage lead with wooden tray. There are 6 whole leads left but there are no size listed on the box. The wooden tray and cardboard is without damage, but the box is beginning to feel age fragile. I have a box of thin leads in the same packaging available. Additional photos by email. I need your zip code to calculate the postage. Paragon No. 2 inkwell. There are some tiny flakes and roughness to the interior rim of the well. There are some manufacturing flaws to the glass. I will provide detailed condition photos by email. I need your zip code to calculate the postage.